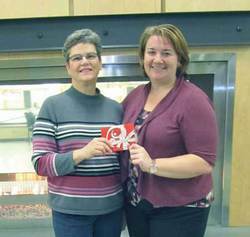 Feb. 6, 2014 5:00 p.m.
Lucky Leduc resident Dianne Bergevin (on left) received an unexpected birthday surprise in the form of a $500.00 gift certificate to the LRC when she won a contest put on by the City. Photo graciously submitted by the City of Leduc. There is nothing so true as the old saying, "If you haven't got your health, you haven't got anything." And one local lady, with a little bit of luck, is helping to keep herself, her family, and even some total strangers, just a little healthier. Leduc resident Dianne Bergevin was amazed to be notified on January 3rd that her name had been chosen as the winner of a $500.00 gift certificate to the LRC. That day also has another special significance for Dianne in that it was her birthday! Backtracking just a bit, during the month of December the City of Leduc sponsored a contest called "Win The Gift Of Health (and fun) At The LRC", with the grand prize being a $500.00 gift certificate to the Leduc Recreation Centre. Entries could be submitted online or in person at the LRC and the contest was very well received with over 300 entries submitted. As a matter of fact, being a big fan of the Rec. Centre, each member of Dianne's family also had their name entered in the contest. Dianne herself is a regular attendee at the LRC, heading down there on a regular basis to play her favourite sport. "It's a wonderful facility!" said Dianne. "I play Pickle Ball there at least once a week." It really is a place for the whole family to enjoy as, along with herself, Dianne's husband, son and two daughters all have their own punch cards for the facility. So for Dianne, when she heard that she had won the grand prize, it was only natural that she share the wealth with her family. She is planning to load up the punch cards for each of her family members so they can all enjoy the fun and healthy options at the LRC. However, Dianne didn't stop with just giving the gift of good health to her own family. She took it even farther by passing along the gift of health to five total strangers. Purchasing two adult day passes and three youth passes (to match the number of people in her own family) Dianne took those passes down to the Leduc & District Food Bank and donated them. "I just wanted to pay it forward a bit," shared Dianne. So many people benefitted from one lucky lady's winning ways that it will be hard to top Diane's birthday celebrations next year, but if the City of Leduc and the LRC partner up to run the Gift Of Health contest again you just never know what might happen!